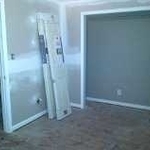 Renting a spacious basement apartment in the lake arbor area of Bowie. 2 bed rooms, 1 full bathroom all utlities included and wifi too. All new stainless steel appliances. Utilities and wifi are included with this rental. This is a new renovated apt, wood floors, separate entrance and lots of street parking and metro bus and train station near by.